02/27/18 – This one is so important, we are posting again. Boat trailering insurance explained. We apologize in advance for the long post, but its worth the read. No one wants to think this will happen. No one wants it to happen. We fix boats every day and it still scares the $*** out of us when we hear that people have had a trailer accident. So this post is not a joke and we think something very important. 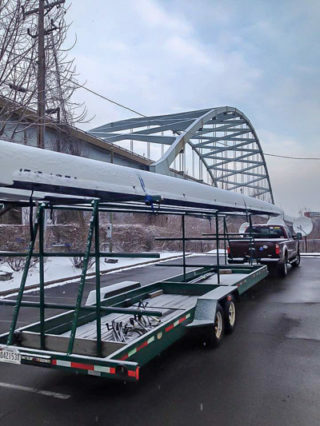 There are many assumptions that are frequently made about pulling a boat trailer, so we asked rowing insurance expert John Leonard to help us cover the important points. Let us start by saying that Finish Line Rowing, Finish Line Shell Repair, and John Leonard of Leonard Insurance Group are not attorneys. This post is filled with our recommendations, not legal advice. You have hooked up your clubs boat trailer to the tow vehicle. Now what? A school bus clips your trailer? Are you covered? A strap fails and a boat falls off the trailer. Whose responsibility is that? We asked John Leonard these questions and he helped us with some great advice. People ask how boats are covered when on a trailer. The equipment coverage we write is physical damage on listed items. It does not cover liability or other people’s equipment. If a trailer is listed, then it is covered for damage to itself under pretty much any accident. Boats on a trailer are only covered if listed on either the clubs policy or some other insurance policy. That could be with us or some other insurance company. If you will be moving someone else’s equipment on your trailer, you should have them either prove they have insurance and/or have them sign some sort of hold harmless agreement in your favor. Just so you know, if you are in a situation where uninsured items are going on your trailer, we can add short term coverage for the trip. There will be a premium charged depending on the value of the equipment and distance of the trip and in some cases the duration of the trip. 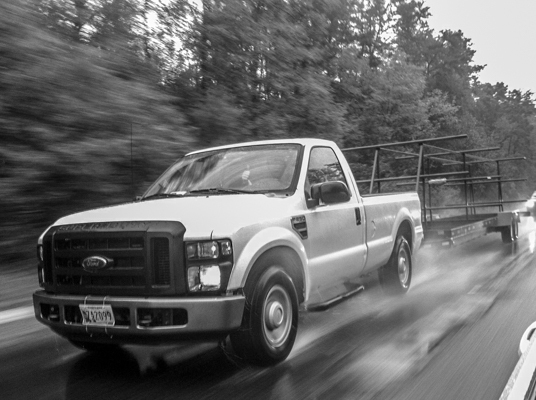 Let’s talk a bit about liability coverage under a trailer situation. A good rule of thumb is that the towing vehicle usually assumes the first position of responsibility in the event of a claim. Now there are ton of potential situations and I can’t come close to explaining all of them. For one example, we are going to say that Joe is club member who owns a pickup truck in his name and it is insured. Joe’s policy is almost never going to pay for damage to something on the trailer that got damaged. It could pay for what is called 3rd party damage or injury. If there was an accident that involved another vehicle and let’s assume it was Joe’s fault or at least his responsibility, then his policy should respond. If a strap breaks and a boat flies off and does damage, that will be Joe’s responsibility. His policy should respond to pay to fix someone else’s vehicle or if they were hurt and sued Joe, it should protect him. In all likelihood it will not protect the club. It would be wise to make sure Joe’s policy is current and has decent limits. I would suggest that $300,000 is the starting point for decent but this is like asking how high is up? The club could have some coverage if they have purchased liability coverage that includes hired and non-owned auto liability (HANO). We usually include that with our liability policies. If you have coverage from the USRowing insurance program it is included. If the club has other insurance then they need to check if they have (HANO) with their agent. In my example, Joe’s truck is a non-owned vehicle, meaning the club does not own it. If the club rents a truck, that is considered a hired vehicle. The hired and non-owned coverage could protect the club and potentially club members if they are dragged into an auto claim but not necessarily the owner of the vehicle. A club member running a club related errand would be another situation to look at. If Bob, the club treasurer, is going to the bank to do club business and has an accident, that could possibly trigger the non-owned auto liability. This usually only comes up if the accident was serious and the club was named as a party in the lawsuit. It totally depends on circumstance and how a lawsuit is brought to determine who is first, second or third in line when it comes to responding to a claim. Depending on where you have your HANO coverage you need to check with that agent for specific questions and answers on this topic. If a club owns a towing vehicle, they would have to purchase a commercial auto policy, which, if properly written, will address these exposures. It will protect the club for liability as well as physical damage to the vehicle if that optional coverage is added. When we write these sorts of policies, in many cases we move the trailer to the commercial auto policy, as it includes liability. An important point to take away from this is that a club member is doing the club a big favor and putting their coverage on the line when they tow a trailer. You can’t really buy coverage to put the club in front of the vehicle owner’s policy. Still have questions? Want to have a more detailed conversation about your insurance? Please don’t hesitate to ask us or John Leonard. Find us at www.FinishLineRowing.com or find John at LIGonline.com and ScullerJon@aol.com. Special thanks to John Leonard for taking the time to provide and share this information.